Parmigiana is a traditional dish made from aubergines. It originally comes from Sicily, but is found in slightly different variations all over the South of Italy. There are many different methods and recipes for making Parmigiana. We have chosen an old Calabrian one (adapted by regional Chef Valentina Olivieri). 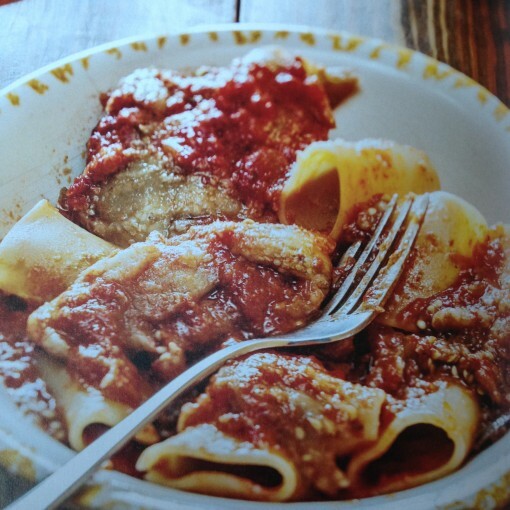 Valentina’s recipe makes a very soft and delicate Parmigiana which works well as a tasty pasta sauce when combined with Paccheri pasta. 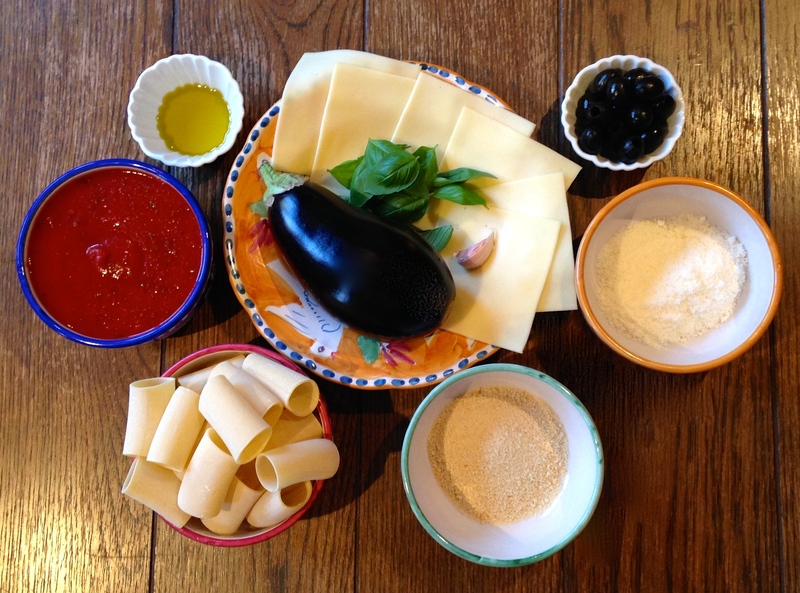 If you prefer, Parmigiana can also be made with courgettes or a mixture of aubergines and courgettes. In this recipe we use just aubergines. Peel and finely slice the aubergines lengthways about half a centimetre thick, place them in a colander, sprinkle with salt and place a dish and a weight on top so that the bitter juices are drawn out. Leave them for 30 minutes, then wash and squeeze each slice to remove excess water. Dry the aubergines and fry them gently in some olive oil. Pat and drain them well on some kitchen roll. Set aside. Meanwhile, make the sauce. Firstly chop the onion and fry gently in 2 tablespoons of olive oil until it becomes soft and transparent. Add the tomato passata and cook on a low heat for about 20 minutes. Put the breadcrumbs, the parmesan and the finely chopped garlic into a bowl and mix together. Drizzle some olive oil in the bottom of an ovenproof dish and then add a layer of aubergine slices with some basil sprinkled on top, cover these with a good layer of the tomato passata, then a layer of the bread crumb mixture, the chopped olives and the cheese. Repeat the layers until almost all of the ingredients have been used retaining some passata and a layer of aubergines for the top. Cook in the oven on a low heat (180 degrees) for about half an hour. 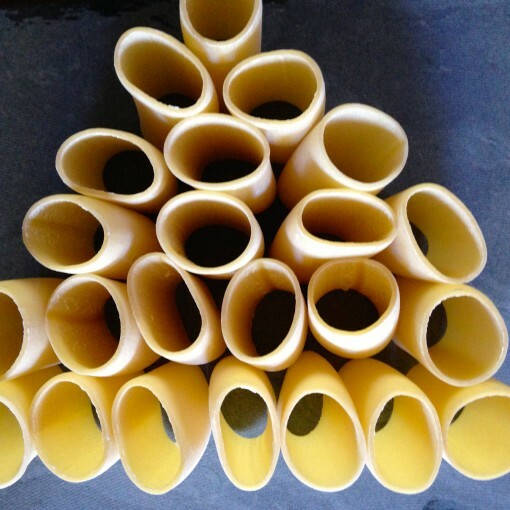 Cook the paccheri in a large pan of salted boiling water, then drain (retaining a little of the cooking water) and quickly dress with the Parmigiana adding one or two spoons of the water you kept aside. As we mentioned before the Parmigiana is a great dish in its own right which you can eat without the pasta, with a side salad or perhaps some roasted potatoes. Preparation of this dish does take a little while because you need to fry the aubergines first but the amazing taste of the end result is well worth the extra time!